Oral tradition suggests the people indigenous to the Yucatán Peninsula have been using this practice a very long time. Long ago there were no ultrasounds to identify visible what was going on inside the womb. There were no x-rays to determine the position of the uterus in the body. Healers and midwives would have to feel for the condition of the internal organs. The ancient Maya made checking the uterine location common practice in their midwife techniques. If the position of the uterus were out of place, they would attempt to massage it back into place. Healers and midwives would have to feel for the condition of the internal organs. The ancient Maya made checking the uterine location common practice in their midwife techniques. If the position of the uterus were out of place, they would attempt to massage it back into place. Women who have not been shown to midwives have probably never discussed the location of their uterus. That is because today’s doctors rarely pay it any attention. Unless the uterus is non-functioning, it’s not a hot topic for conversation in the physician office. If a woman feels pain during pregnancy, she will likely be encouraged to lie down. If she has a narrow pelvic bone, she’ll be recommended for a c-section. These are just two examples of things midwives will handle differently. Midwives who adhere to this Arvigo technique are often favorites among clients. These ancient midwife rituals have proven beneficial for some different issues. Though most relate to pregnancy, others can help women facing some health issues. Here are a few examples. A professional midwife had been getting complaints from a new client. The woman had pain in her hips and upon the midwife’s examination was diagnosed with a left-leaning uterus. Because her uterus was off to the side, the baby was throwing her lower limbs off balance. Using the gentle massage techniques taught by the Maya, the midwife got her client’s uterus back into alignment. She had her client take a walk so everything could settle into place. A week later her client was feeling great and pain-free. The same midwife had another client with a very narrow pelvic bone structure. After feeling around, she noted that her client’s uterus was over top of the pelvis. This a problem because the uterus needs to be inside the pelvis. If she were to go into labor, it could mean the baby could get stuck inside. Doctors would have no choice but to perform a C-section to deliver the baby. 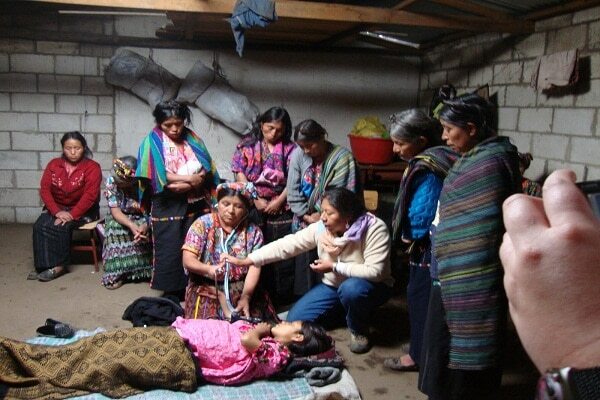 She repeatedly employed the Maya midwife techniques on this client. Though her delivery was not easy, she still was able to give birth vaginally. Other clients report that the Arvigo practice will stimulate the cervix. This may allow pregnant women to deliver on time if their baby is stubborn. It’s crucial that women have repeat treatments two weeks before their due date for best results. Women who have given birth may experience bladder control problems. A regular doctor will recommend they do an exercise known as “Kegels” to correct the issue. During the exercise, women are to practice squeezing their pelvic muscles during urination to stop the flow of urine. This exercise is useful, but when coupled with the Maya techniques it may resolve faster. Painful menstruation is another very common problem among women. Midwives teach their clients Arvigo techniques to alleviate the pain. These “self-care” midwife techniques can be performed in the client’s home daily to keep terrible cramps away. These are few of the Maya practices that women can get benefit from. These midwife techniques can keep women feeling more healthy and comfortable during their pregnancy. They can also be useful after the pregnancy as well.